At Autocuehire we take the stress out of your presentation with autocue teleprompting. We have decades of experience in all kinds of presentations. We use the most up to date equipment, the most reliable software and our operators are always on hand to help with final tweeks to your script or for that one last rehearsal to settle the nerves. We offer a full autocue and teleprompter hire service that can add value to your presentation. If you’re worried about forgetting a key piece of information or the ‘umm’ factor then call us today and we can design a custom made solution for your event. What are the benefits of an Autocue or Teleprompter from us? Piece of mind knowing that your script is right in front of you being scrolled by a seasoned professional so the only thing you have to worry about is looking good. You don’t have to worry about losing your train of thought. Forgetting a key point is a thing of the past. You get to look your audience in the eye rather than looking down at a piece of paper. A trained professional is on site throughout, able to amend your script, and rehearse with you whenever you require. The teleprompter is traditionally set up using twin stands each with a piece of glass securely attached to the top, these can be set up at the presenters position (usually at a lectern, or rostrum) or be free standing on the stage wherever your presenter would like to address the audience. The height of the stands is fully adjustable to the height of the presenter and our electric poles can have up to 15 programmable heights at the touch of a button, allowing presenters of different heights to see the autocue system with ease. From the perspective of the audience the teleprompter glass looks transparent whilst the presenter can clearly see their speech displayed in front of them, creating the illusion that the presenter is eloquently delivering a speech without aid. Our monitors also support additional composite BNC outputs, allowing our operators to either loop the BNC signal to additional autocue systems, or provide an output to one of your comfort monitors. 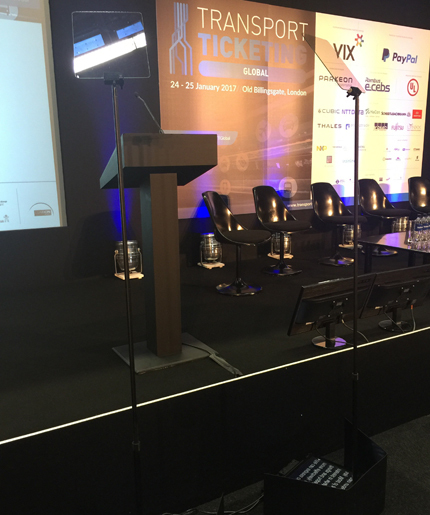 Our service includes our professional operators delivering the conference autocue kit to the venue of your choosing, setting up the equipment and inputting, editing and scrolling your script during the event.